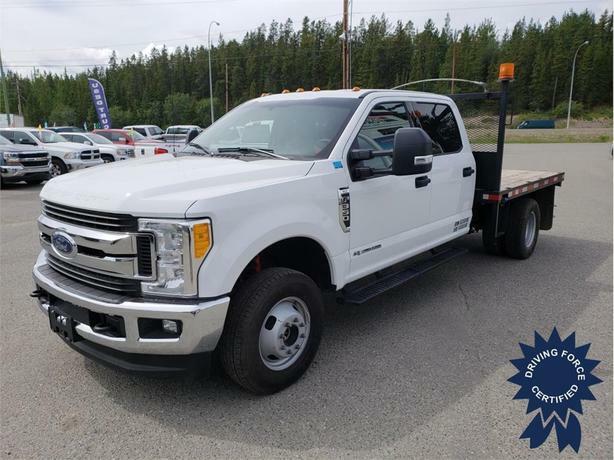 This 2017 Ford F-350 Super Duty Crew Cab 6 Passenger 4X4 DRW 9-Foot Flat Deck Truck comes with a 176-inch wheelbase, TorqShift 6-speed automatic transmission, limited slip with 3.55 axle ratio, 157-amp alternator, 17-inch argent painted steel wheels, platform running boards, transfer case and fuel tank skid plates, PowerScope trailer tow mirrors with heat, fog lamps, 8-way power adjustable driver seat with lumbar adjuster, reverse sensing system, 6 upfitter switches, power-adjustable gas and brake pedals, Class V towing with harness, hitch, brake controller, and trailer sway control, auto locking hubs, SYNC Communications and Entertainment System including enhanced voice recognition, 911 Assist, 4.2-inch LCD screen in centre stack, AppLink, 1 smart-charging USB port and steering wheel audio controls, three 12V DC power outlets, power door locks, tire specific low tire pressure warning system, buggy whip, beacon light, and GVWR rating of 14,000 lbs (6,350 kgs). The 6.7-litre Power Stroke V8 Turbodiesel engine provides 440 horsepower at 2,800 RPM and 925 lb-ft of torque at 1,800 RPM. Touch base with us to discuss purchasing or financing options that are right for you and experience the difference you will only find at DRIVING FORCE Vehicle Rentals, Sales and Leasing.